Frankie Dettori returns to British riding action this Saturday, February 2 at Lingfield Park where Wissahickon (Pictured) and Kachy are the headline horses in their respective Fast-Track Qualifiers on Polytrack. Dettori resumes his partnership with the 117-rated Wissahickon, trained by Newmarket-based John Gosden, in the eight-runner £45,000 Listed Betway Winter Derby Trial (2.55pm) over 10 furlongs. The brilliant rider, who celebrated his 48th birthday on December 15, is having his first British ride of the year on the four-year-old Tapit colt. Dettori had a 2018 to remember, partnering the joint-best racehorse in the world, Cracksman, to a second runaway G1 QIPCO Champion Stakes victory and star filly Enable to a second G1 Qatar Prix de l'Arc de Triomphe win. He received the 2018 Longines World's Best Jockey Award last month, having first won the prestigious accolade in 2015. 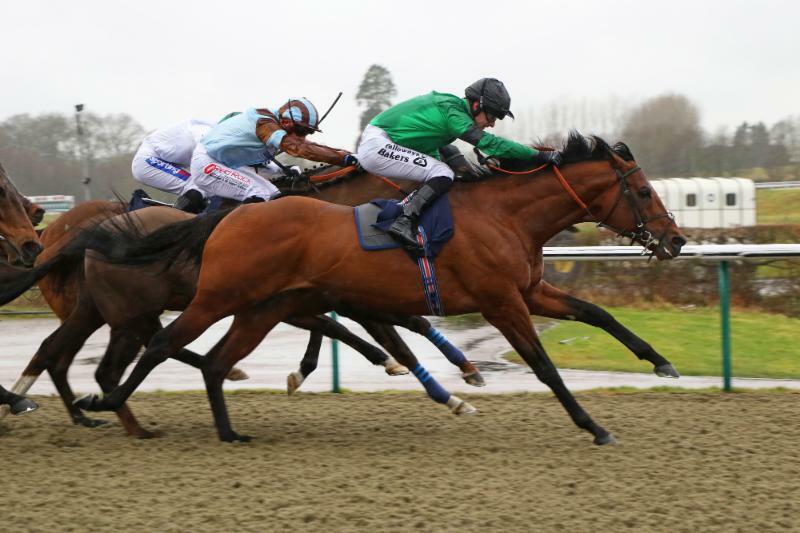 The winner of Betway Winter Derby Trial is guaranteed a free start in the £200,000 Betway Easter Classic back at Lingfield Park on £1-million All-Weather Championships Finals Day, Good Friday, April 19. Wissahickon, owned and bred by George Strawbridge, is the 4/6 favourite with Betway after winning on six of his eight starts, with Dettori on board for two of those victories, including an easy success on turf in the historic Cambridgeshire Heritage Handicap at Newmarket in September. The colt returned from a break to defeat Big Country (Mick Appleby/Luke Morris, 9/2 with Betway) by just over two lengths in the Listed Betway Quebec Stakes over the course and distance at Lingfield Park on December 22, his fourth win from five attempts on the All-Weather. Wissahickon is joined by stablemate Court House (Robert Havlin, 5/1), who drops back in trip after winning a 12-furlong conditions race in good style at Lingfield Park on January 9. Big Country has posted two excellent efforts at Lingfield Park this winter, having also gone down by a neck to 2018 Betway Winter Derby hero Master The World in the Listed Betway Churchill Stakes on November 17. Master The World's trainer David Elsworth is represented in the Betway Winter Derby Trial by Main Street (David Probert, 14/1), a Listed runner-up at Goodwood on his penultimate start for Gosden, who is having his first start for the Newmarket yard. There is a French challenge courtesy of In The Lope (Pia Brandt/Adam Kirby, 25/1). The five-year-old is a dual Polytrack winner in France, including last time out in an extended nine-furlong handicap at Deauville on December 18, and ran well on his one previous visit to Lingfield Park when a staying-on fourth in the 2017 Listed Betway Churchill Stakes. Trainer Pia Brandt, based in Chantilly, said today: "In The Lope seems better than ever at the moment. He had top-weight at Deauville last time and did it very nicely. "He has showed in the past that he can handle Lingfield and I think he is better horse now than when he last ran there. "If you could take away the 117-rated horse, I would be very pleased! Wissahickon should be hard to beat, but after that I think we have a fair chance of being up close behind him. "The aim for In The Lope is Finals Day and, if all goes well on Saturday, he will come back for Winter Derby. These three Lingfield races are his main targets for the winter season, then he will have a break." Brandt is no stranger to success in the All-Weather Championships, having Fresles saddled to win the Ladbrokes All-Weather Fillies' And Mares' Championship on Finals Day in 2015. Newmarket trainer Jeremy Noseda captured the Betway Winter Derby Trial with Grandeur in 2014. He saddles course and distance scorer Abe Lincoln (Shane Kelly, 16/1), who took third in last year's Betway Easter Classic. The runners also include Chiefofchiefs (Charlie Fellowes/Richard Kingscote, 33/1), winner of a mile handicap at Kempton Park on January 4, and Time To Study (Jamie Spencer, 25/1), who is having his first start for Ian Williams. Last year's winner Kachy (Tom Dascombe/Richard Kingscote, drawn eight, 11/10 favourite with Betway) bids to continue his excellent record on the All-Weather in the £45,000 Listed Betway Cleves Stakes (1.45pm) over six furlongs, a Fast-Track Qualifier for the £150,000 Betway All-Weather Sprint Championship over the same distance on £1-million All-Weather Championships Finals Day, Good Friday, April 19. Kachy has been successful on three of his four starts on the All-Weather, with his only defeat coming behind subsequent G1 Diamond Jubilee Stakes runner-up City Of Light in the 2018 Betway All-Weather Sprint Championship. Following a wind operation, the six-year-old looked as good as ever on his latest start when setting a track record for six furlongs in a conditions race on Tapeta at Wolverhampton on December 26. The opposition is headed by the Cenotaph (Jeremy Noseda/Ryan Moore, drawn three, 9/2), whose three victories on Polytrack at Chelmsford City in 2018 included the valuable Chelmsford City Cup Handicap in September. Corinthia Knight (Archie Watson/Edward Greatrex, drawn seven, 6/1) is an eight-time winner on the All-Weather, with the pick of those successes coming over course and distance in the 2018 Ladbrokes Three-Year-Old All-Weather Championship. G1 Commonwealth Cup fourth Stone Of Destiny (Andrew Balding/Oisin Murphy, drawn six, 10/1) showed signs of a return to form in a Fast-Track Qualifier on Tapeta at Newcastle on January 22, when a close third to Encore D'Or. Mokarris (Simon Crisford/Robert Havlin, drawn nine, 8/1) was a very useful two-year-old in 2016, when he finished runner-up in the G2 Gimcrack Stakes at York, but has not been seen out since May, 2017. Lightly-raced four-year-old Sir Thomas Gresham (Tim Pinfield/Martin Dwyer, drawn four, 10/1), who has won on two of his three starts, Roman River (Martin Smith/Gerald Mosse, drawn one, 66/1) and Gorgeous Noora (Archie Watson/Hollie Doyle, drawn five, 33/1) complete the nine runners. Lingfield Park's seven-race programme starts at 12.35pm and ends at 4.05pm.